Carbohydrates serve as principal energy sources for the body.They are defined as poly hydroxyaldehyde or ketones or the substances which on hydrolysis yield either aldehyde or ketone. 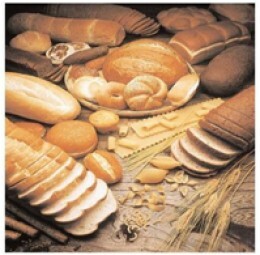 Carbohydrates constitute the major (80% of dry weight) part in the plant. The carbohydrates which are sweet in taste are collectively known as sugars (mono saccharides & disaccharides); while those which are not sweet are called non sugars (poly saccharides). Isomers: Compounds with the same chemical formula are called isomers. Glyceraldehyde (an aldose) & Dihydroxyacetone (a ketose) have the same chemical composition, C3H6O3, but differ in structure they are structural isomers. Epimers: If two monosaccharide isomers differ in configuration around one specific carbon atom (with the exception of the carbonyl carbon) they are defined as epimers of each other. Simple sugars containing an aldehyde group are called aldosesand those with a keto group are called ketoses. Reducing sugar: Sugars that contain free aldehyde or ketone group in open chain configuration can reduce cupric ions to cuprous ions and hence are called reducing sugar. Test for reducing sugar: Fehling’s and Benedict’s test. 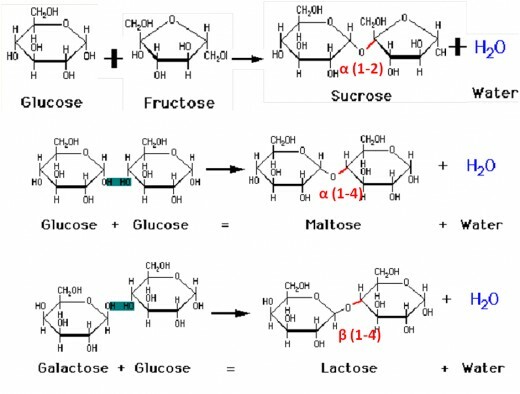 Ribose( Pentose sugar) is found in every animal and plant cell.Its reduced form deoxyribose is found in DNA. This is when two mono saccharide join to form a disaccharide. The reaction is similar to condensation. The reaction involves the water been given off. Maltose(Malt sugar) is found during germination of starchy seeds. Poly saccharides are complex carbohydrates formed by condensation of a number of mono saccharides (more than 10). Storage polysaccharide of plant cells. Composed of the glucose polymers (80%amylose + 20%amylopectin). Amylose-The water soluble fraction which is linear polymer of α-D-glucose. Amylopectin- The water insoluble fraction which consists of branched chains of α-D-glucose. Major glucose storage molecule in animals (stored in liver and skeletal muscle). The liver reserve of glycogen is used to regulate blood glucose levels. Bacteria and yeasts store glucose as yet another type of polysaccharide called Dextran. Dextrans are also used as components of blood plasma substitutes (plasma expanders) and foodstuffs. A fructose polymer is used as a starch substitute in diabetics ‘dietary products. Most abundant polysaccharide, indeed the most abundant organic molecule in the world. Structural polysaccharide, used to make plant cell walls. Β (1-4) polymer of D-glucose that can contain thousands of glucose monomers. 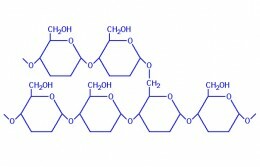 Cellulose cannot be digested by animals because they do not produce an enzyme capable of cleaving the glycosidic linkage. A homopolymer from1-4-linked N-acetyl glucosamine. It is the most important structural substance in insect and crustacean shells, and is thus the most common animal polysaccharide. Second most abundant organic molecule. It also occurs in the cell wall of fungi. eg: Pectins, Phycocolloids (ex:Agar-agar), Hyaluronic acid,Chondroitin sulphate,Keratan sulphate. Polymer of galacturonic acid, arabinose, and galactose. It is a major constituent ofmiddle lamella. During ripening of fruits, pectate of middle lamella braks due to which fruits become soft. Are short chains of monosaccharide linked together by glycosidic bond. O-linked Oligosaccharides attached to the protein via O-glycosidic bonds, to the OH group of serine or theonine side chains. N-linked Oligosaccharides attached to the protein via N-glycosidic bonds, to the NH2 group of asparagine side chains.